Delfin I takes you one step beyond in terms of service, intimacy and personal attention. This classic river vessel features 4 oversized suites, all with private panoramic terraces, 2 of which offer a private whirlpool for the ultimate treat. Floor-to-ceiling windows allow nature to be part of the natural suite décor, and cabin service 3 times a day will ensure you the most personalized experience. On the top deck, guests will find a lounge area, bar and entertainment center which are perfect places to relax in while the jungle unfolds before your eyes. Occupation : 8 Passengers, (up to 12 with full triple accommodations). 2 Deluxe Master Suites with cool water whirlpool. Dining area with a single table so everyone can share the dining experience (option available to have private in-room dining). Outdoor top deck lounge area with stocked bar. King or 2 double beds with bedding of 100% Peruvian pima cotton. Native design elements and handicrafts. Hot water showers with organic toiletries. Roof-to-floor paneled windows provide unobstructed views of the ever-changing river conditions and the human communities that live symbiotically with each other. Tailor-Made Charters: These allow us to personalize your Amazon voyage. In addition to our regular itineraries, we can create a unique, fully custom-designed program just for you and your loved ones. 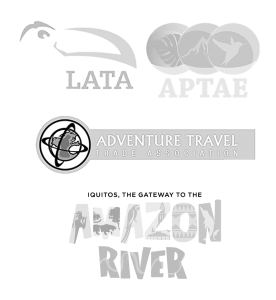 Bird watching, professional fishing, and deep exploration of jungle trails are just some examples of specialized daily excursions we can arrange for your specific group’s interests, skills, and sense of adventure. On your first morning with us, we recommend getting up early to appreciate one of the most important zones of the Pacaya Samiria National Reserve. Never does nature seem more bountiful than in the tropics, and early rising is always rewarding since wildlife is most abundant and active with the rising of the sun.. This is a unique opportunity; you will get to the only Canopy Walkway in this area, an experience unequaled in the rainforest! At a height of over 25 meters (85 feet) and extending for 500 meters (one-third of a mile), the Canopy Walkway provides a view of the rainforest from the treetops, the best vantage point for observing Amazon wildlife and vegetation. Located on the main deck are 2 Deluxe Suites of 360 square feet with 180° panoramic floor-to-ceiling windows. Both have a private terrace of 320 square feet including a cool water whirlpool, making Delfin I the first and only river vessel with this unique feature. Located on the 2nd deck, these 2 Master Suites of 340 square feet and a private deck of 320 square feet share the same comforts as our Deluxe Suites, including the vessel’s signature panoramic floor-to-ceiling windows, but without whirlpools. *Triples available with base in a futon bed, for adults or children. Located on the 2nd deck, the Dining Room offers an unrivaled level of sophistication with simple and natural products. Peruvian cuisine, one of the world’s finest, blends the country’s cultural diversity, the Amazon’s wild choices of fresh ingredients and various immigrant traditions to create the most unique and delicious dishes. Thanks to the cultural diversity of our country, Peruvian gastronomy has become one of the most craved-after kitchens on the continent and the world. Because of this, Delfin, apart from being dedicated to bringing you the adventurous Amazonian spirit into your life, is proud to have the opportunity to present you with a full menu of foods and beverages prepared in utmost style, quality, and originality. in the school of Peruvian gourmet gastronomy infused with touches and inspirations from the rainforest around you. We are happy to accomodate any special diets and restrictions with timely prior notice. The dress code is casual for all excursions and meals. On the top deck, there is a welcoming and peaceful environment perfect for those who want to get away from it all. During the day, enjoy breathtaking landscapes and sights. At night, soak in the billions of brilliant stars in the sky. This open air lounge is also equipped with an entertainment center, a range of DVDs, reading materials about the Amazon rainforest, an array of wildlife presentations, an XBox, and an open bar. Coffee and tea are always available. Botes Auxiliares: 2 botes de aluminio de 8 pasajeros cada uno que puede doblar capacidad en caso de emergencias acondicionados con motores de 4 tiempos de 40 hp. Y comunicación con el Barco. 2 botes auxiliares con capacidad de 8 personas cada uno y con capacidad para cargar al doble en caso de emergencias, provistos de chalecos salvavidas y luces de emergencias. Siempre hay un miembro de la tripulación de guardia durante las 24 horas del día, este la embarcación acoderada o navegando. 2 miembros de la tripulación son entrenados en primeros auxilios.